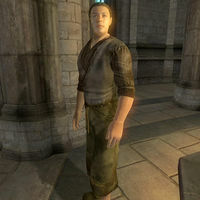 Hil the Tall, a Nord priest, functions as healer and serves the Nine at the Chapel of Arkay in Cheydinhal. He is also a basic trainer in Illusion although both he and other Cheydinhal citizens will tell you he teaches Alteration. While he may have joined priesthood to avoid military services, Hil is still very devoted as a priest of Arkay, and he puts a lot of effort in fulfilling his duties in the Chapel. He sleeps in the Chapel Hall from 12am to 6am, and after he wakes up, he will immediately head to the Chapel Main Hall to pray in front of the Altar of the Nine for two hours. At 8am he will stop praying and simply stroll around the Chapel until 12pm. At that time, Hil will head outside to roam around the small island along the river in the east side of the town, where he will relax for a two hours until he returns to the Chapel at 2pm. Before he starts with his second moment of praying, Hil will spend two hours wandering around the Chapel Hall until 4pm, when he will surface in the Chapel Main Hall again to pray for a second time. When the clock hits 6pm, Hil will retire to the Chapel Hall again and stroll around the area for two hours. At 8pm, he will grab a piece of food and will sit in one of the available chairs and eat a two-hour dinner. Once he has finished, he will wander around the Hall again for two additional hours, until he finds a bed and goes to sleep. Hil's services will be available at any time of the day, except when he is sleeping or wandering around Cheydinhal. On rainy days, Hil will skip his trip to the island at noon and will instead spend the two hours in the Chapel Hall, offering his services for two additional hours. He wears a lower-class outfit consisting of a coarse linen shirt, sack cloth pants, and a pair of clogs. He carries the chapel key, the key to the Undercroft and a small amount of gold. Hil knows a leveled set of Priest spells and extra restoration spells. Apparently he loves everyone and everything, as he says when first introducing himself as well his services, although he incorrectly states that he is a trainer in Alteration: "Praise Arkay, and all her [sic] little woodland creatures! I'm Hil the Tall, Priest of Arkay. I'm also a trainer in the arts of Alteration [sic]. I love magic, too. I love everything. And everyone. You, too." If you ask him about the city of Cheydinhal, he will tell you how he became a priest of Arkay after having fled from Skyrim. "I came here because I love nature. And because I didn't want to serve as a boot wizard in a mountain legion in Skyrim." The people of Cheydinhal also seem to know the true reason for which Hil became a priest, as they will comment when talking with each other: "Rumor has it he joined the priesthood to avoid military service. What a coward." and "I heard he learned about Alteration because he is too scared to fight. Pathetic. ", "Have you heard about why Hil the Tall joined the priesthood?" and "Do you know why Hil the Tall became a priest?" Also, when asked about rumors it appears that the townsfolk also think he is an Alteration expert, often saying, "I understand Hil the Tall will teach Alteration to anyone willing to pay." and "I've heard that Hil the Tall knows a lot about Alteration, how to cast shields and that sort of thing." Hil can be killed during the Knights of the Nine quest The Sword of the Crusader. If he dies for whatever reason, he will be replaced at the end of the Knights of the Nine questline (after Umaril the Unfeathered) by Esbern, who has the same schedule and services as Hil. During The Sword of the Crusader, it is very likely that Hil will pick up an Ayleid Battle Axe to help fight the Aurorans, which he will carry around for the rest of the game. Although he incorrectly says "Praise Arkay, and all her little woodland creatures! ", the Aedra he is likely referring to is Kynareth, since Arkay is not only male, but is also the god of funerals, not "woodland creatures". True to his name, Hil the Tall is noticeably taller than other NPCs, even Altmer. This page was last modified on 15 November 2018, at 20:26.